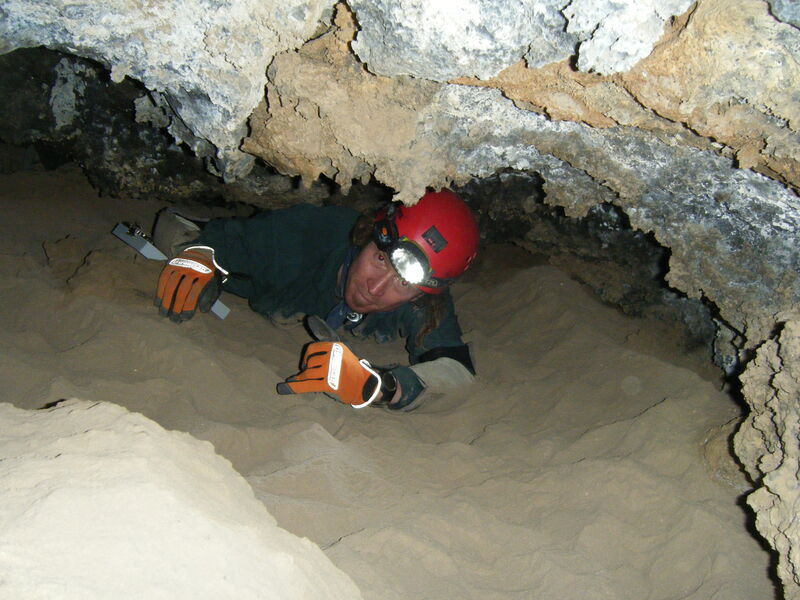 Guest writer number 6, Arita Baaijens, has been very helpful when it comes to advice on all topics regarding the desert. Once I asked her, since she speaks Arabic and is as much Bedu as the Bedu themselves, are you Moslem? Arita got slightly upset and answered: I am a free soul! Indeed she is! She is also a biologist, author, photographer and a Fellow of the Royal Geographical Society. Twenty years ago she gave up her job as an environmentalist, bought camels and made a solo crossing across the Western Desert of Egypt. 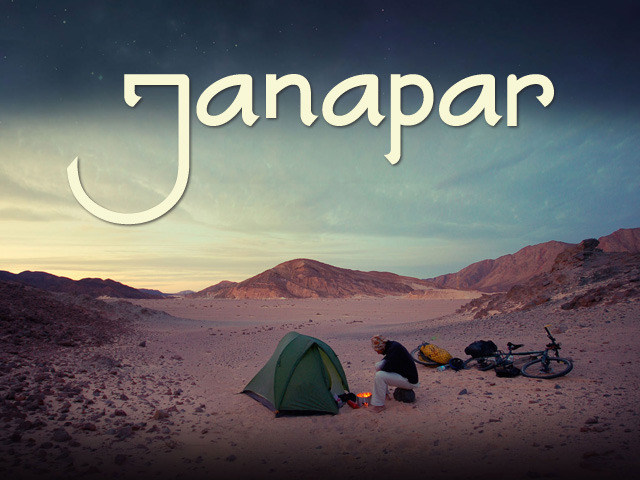 Today she has made over 25 expeditions (3-6 months at a time) with her own caravan of camels all over Egypt and the Sudan. 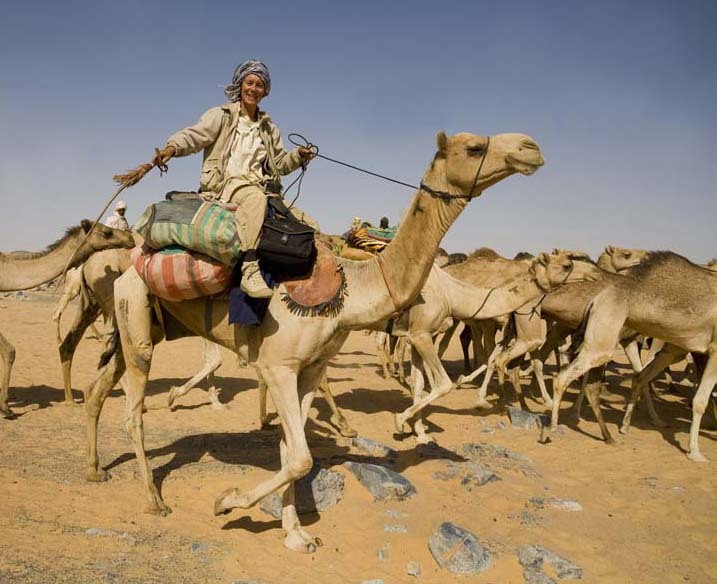 She travelled the Forty Days Road twice with trade caravans of camels. In the eastern desert of Sudan she and archaeologist Krzyzstof Pluskota discovered a hidden valley with hundreds of petroglyphs depicting cows. She just came back from Darfur (Sudan), Egypt and Mauritania. Although she knows everything about camels, she intends to travel on horseback from Siberia to Afghanistan. 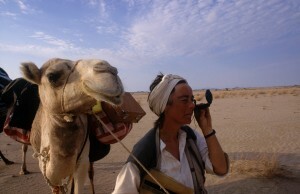 Her most recent book Desert Songs, a woman explorer in Egypt and Sudan (AUC Press, 2008) won an award in the Netherlands. Female leadership in the desert! During the past twenty years I’ve spend most winter seasons exploring the desert of Egypt and Sudan on camel. Sometimes friends kept me company during a leg of the journey, which was great. Camels are wonderful animals, but a conversation with them can be boring because they are only interested in food. So it was fun to have a friend around, although, to be honest, with some of them the fun didn’t last very long. A week at the most. After that the top-dog type of guys – never seen a desert, let alone knew a thing about camels – would point out how I could and should organize my caravan in a much better and more efficient way. Another friend was annoyed because I made him feel insecure whenever he walked with the camels. Why? Picture the following scene: my friend climbs steep hill after steep hill with heavily laden camels and after two hills I, of course, tell him to circumnavigate those hills. 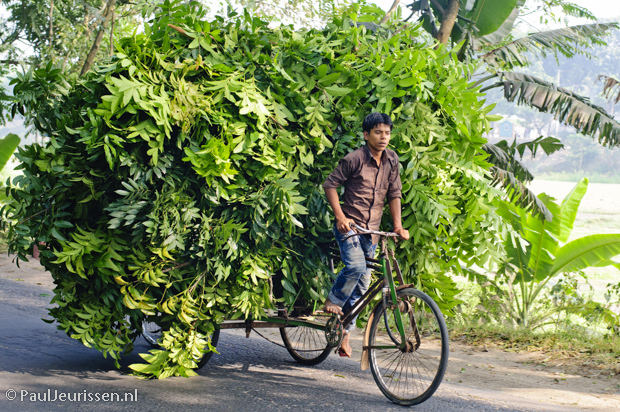 Something he would have done automatically if he would have been the one to carry the load. Anyway, my friend was not amused and our never ending arguments threatened the relationship. So in the end I decided to give it a try and shut up in order to let him learn from mistakes. It worked. Until one of the camels seriously injured herself because of a stupid and unnecessary mistake my friend make. ‘No more soft approach,’ I decided there and then. My top-dogs friends had a problem with female leadership, I decided. But as the list of incidents grew doubt crept in. ’Maybe it is me,’ I thought. After all, I was the only constant factor in all those stories. A man in my position would never question his leadership style, but being a female, I wondered what I could do to avoid future fights. I searched for female role models in the desert and hoped they could teach me a few tricks. But alas, female caravaners were hard to come by. All the local desert guides where male and they couldn’t care less about the feelings of their staff. On the contrary. 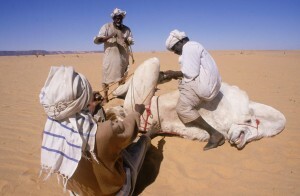 A guide, or chabir, does not accept any criticism during a dangerous desert crossing. Which makes perfect sense. A guide is responsible for the lives of people and animals in the caravan and conflicts create tension and confusion, which in turn may affect his judgement. Imagine my joy and disbelief when about five years ago I came across a thesis about trade in west Africa. The historian who wrote it claimed and proved that women in the region played an active role in caravan trade. As a merchant, investor and even as a caravaner. Recently I travelled to Mauritania and met two female caravaners, both well into their seventies now. I also met the sons and daughters of a locally well known woman who had worked as a trader and a caravaner. One of her sons, now a grandfather, rubbed his knees and shins with a painful grimace when he talked about the long journeys with his mother. The whole family went together, parents and children, and they were on the road for several months. The children walked or sat on top of salt loads, hour after painful hour. The caravan would only come to a stop after sunset. And after such an exhausting day the mother still had to cook. Women were also responsible for selling goods at foreign markets. The profit was used to buy local products they could sell back home. When I asked men and women about the daily routine in a trade caravan, nothing indicated that women had an inferior position. “Men and women worked together,” an old man commented. Many others confirmed this. In I learned that in Mauritania women have always had a very strong position in society and within the family. Women are also well educated. When I explained to a few young women that their Dutch sisters, in order to keep their marriage intact, pretend that their husband is the boss, the girls laughed and laughed. They just couldn’t believe what I said. In Mauritania, they giggled, it is the other way around. Men like strong women. Indeed, if a spouse bosses his wife around she knows something is wrong. Very wrong. When a husband acts out of character he usually fancies another woman. Needless to say that I had the time of my life in Mauritania, where I met a lot of bold, bright and strong women. The Mauritanian caravan model functions, these role models taught me, because next to every strong woman stands a gentle man. the article about more women in adventure was the one that got me. ago I decided to ride a bike from Slovenia to Beijing, China and back. but for sure they are doing them. just different. But at the end of the day it is egoistic selfish act. beside it all, the question still remain now what is next? There is one thing I had to do after I return back was read and read. all and there is no price tag on it. decide to share your opinion. I would love to meet you, Arita, and I wish had known you before I went walking! What a wonderful article – and I related to every word. Keep trekking, girl, what amazing adventures you have had and continue to do. I am envious and admiring…. So good to know that there are more women out there traveling with camels!! Wonderful. And the same for you > keep going girl… hopefully our paths will cross somewhere in the desert. Am sure we’ll have a great conversation sitting by the fire. 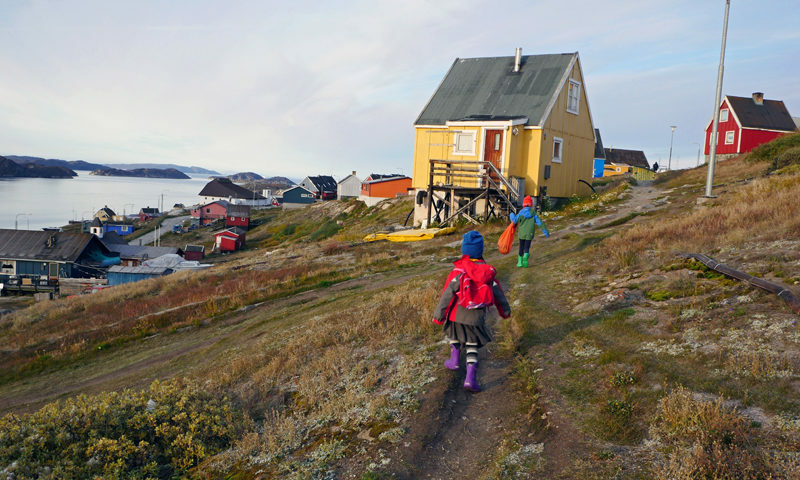 Pingback: Explorer Mikael Strandberg » Exploration: an outdoor activity or what? Hi! What a wonderful and inspiring article and life you lead! I think when you are young, you can follow the rules because you are afraid of ‘not’ fitting in. When you are older, you need to kick the traces and follow your heart. It is hard to go against the tide…but what if you never did and wanted to do this so much? At the end of your life, what would you have? I am writing a fictional (very fictional) novel based on the historical woman, Tin Hinan. I have been researching and writing this book for three years now. It is almost completed. In this research, I have found Berber/Egyptian Goddesses, found out much of Berber traditions, and since I am a belly dancer, I work with Berber men in the restaurant I dance in. They are amazing people, and I feel though not of their culture, very, very close to them and their history. As to that history, I have had to study camels, caravans, the routes, the Ahoggar Mountains, Algeria, the Tuaregs, other peoples in the countries of Morocco and Algeria and around this historic area. I have learned customs and traditions, and I find that all people are generally alike. Strip off the modern issues of consumerism, etc. and you find that we are all of a people. By the way, in a few days I will be 63 years old. 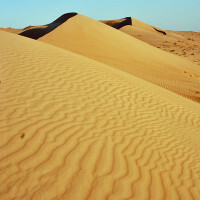 I have ridden on one camel and been spat at by the same, and I intend in a few years to travel the desert…somewhere~! Life is only limited by our vision. Break away the cobwebs of convention, especially for women, and you will soar!